education funding hostage to a damaging set of policies he wants to unilaterally impose, including radically increasing the number of charter schools-- which could mean 250 more charters statewide and in NYC -- accelerating the process of school closings, putting them under state or private control, providing tax credits to be spent on private school tuition, and requiring even more high-stakes testing, with teacher evaluation and job security to be based 50% on student test scores on the highly flawed state exams. Just as the Congress and many states are moving away from the overly prescriptive and damaging obsession with testing which has caused so many schools to focus on test prep rather than teaching (see this video about NYC teacher of conscience Jia Lee's testimony before the US Senate about why she refuses to give the state exams), Cuomo is doubling down on the corporate reform policies of privatization and testing that our students were subjected to during Bloomberg's reign, and which caused so much havoc and disruption to the system. Cuomo's vendetta against public schools and public school teachers is not new; in 2013 he called for a "death penalty" for struggling schools, though he added that "I don’t want Albany to sit there and tell communities how to run their schools" -- about which he seems to have changed his mind. In 2014, he said public schools were a "monopoly" that he wanted to bust. Clearly, the fallible Common Core exams are a weapon he is eagerly using to achieve this, even though during his recent re-election campaign he ran television ads saying that he believed that the "Common Core scores" should not be used "for at least five years," including recorded on student transcripts, and even then, "only if our children are ready". If the test scores are this unreliable, how can they be used to judge teachers and even cause them to lose their jobs? Cuomo hasn't explained the apparent contradiction. 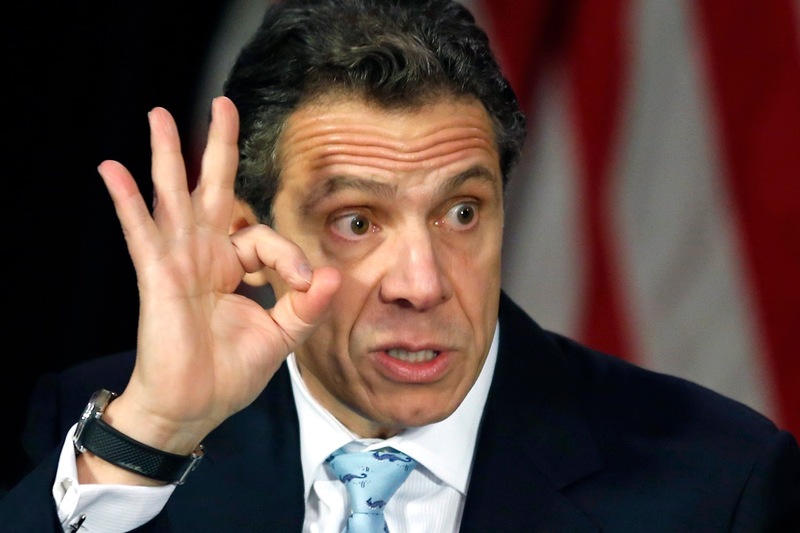 In reality, Governor Cuomo is attempting a naked power grab, in which he would strip districts and local communities of their authority of which schools to close, which teachers to hire and fire, and enable privatization to grow rampant, with no ability of district educators or school boards to stem the tide. The ability of principals to assess their own teachers would count for only 15% in the system, with the rest based on state tests at 50%, and the observations of "independent evaluators"selected by the state at 35%. Not only has the test-score based teacher evaluation system been repudiated as invalid by the National Academy of Sciences, the American Statistical Association, and the American Education Research Association, but Cuomo's proposal would require an expensive increase in the bureaucracy, as every school and district would have to hire these new evaluators who knew nothing about our teachers or our schools. In addition, teachers would be judged by the same rigid formula whether they had class sizes of 18 (which are found elsewhere in the state) or 30-34 students in their classes -- which are all too common in NYC. Last week, among the many organizations representing parents, teachers, principals, school boards and Superintendents testifying before the State Legislature, the only groups supporting this radical teacher evaluation system was the charter school lobby, whose teachers are exempt from this unfair evaluation system. Meanwhile, Cuomo is threatening that he will not provide any significant increase in state education aid unless the Legislature adopts all these policies. Yet according to the CFE decision, the Governor still owes the city's schools over $2 billion in state aid, but rather than fund our schools fairly, he would prefer to expand privately run charters, because of the influence and the millions he has received from the hedgefunders who support privatization. Each new NYC charter school would get free space at the city's expense, according to the law Cuomo passed through last year, while thousands of our public school students would remain crammed into yet larger classes in even more overcrowded schools, or sitting in trailers, or on waiting lists for their zoned schools. See the chart below, prepared by Peter Svab of the Epoch Times, showing how the Governor has received over $1.6 million in campaign contributions from the billionaire members of the charter/hedgefund lobby.No wonder only 18% of voters trust Cuomo on education, in the latest Siena poll from January. Please come to one of the many forums taking place in all the five boroughs about how we can fight these policies, starting this week and the week after. Check out the fact sheets below, including one showing how much money Cuomo has received from the charter lobby to strip our public schools of decision-making power, funds and space, and turn our school system over to the state and his hedge fund buddies.